Finally my old three register Heuer chronograph is ready to wear again. I got this wonderful old clunker very cheap on Ebay a couple of years ago. It was in a sad state. 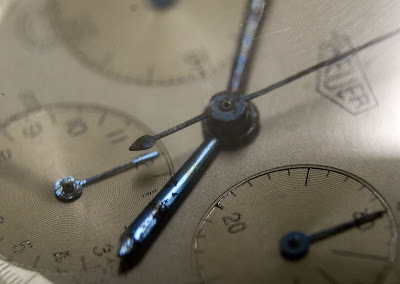 The movement was soaked in hobbyoil, and the dial was totally messed up by the oil. The good thing was that the case was good, and the movement looked complete. This is what it looked like after I removed the blued steel hands. The movement needed some work. The mainspring had ’set’. This condition usually occurs with older steel mainsprings that have been coiled up in the mainspring barrel for too long. 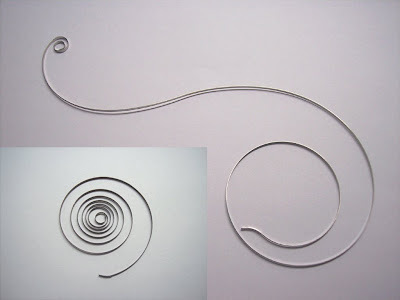 A modern alloy mainspring in good condition should have an ‘S’ form as pictured below, the old steel mainspring is pictured inset. Secondly, the sliding gear spring was broken. This spring provides pressure on the sliding gear to ensure that the chronograph finger can advance the chronograph mechanism when engaged. 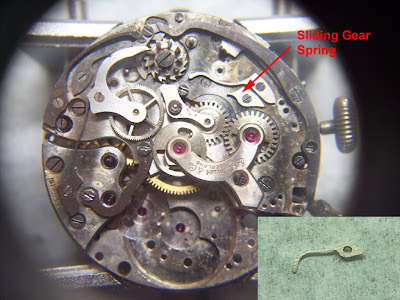 With the movement, Valjoux 71, cleaned and back up and running, it was just a matter of straightening the centre second hand and the old movement was in great shape again. The original crown is still in very good shape. 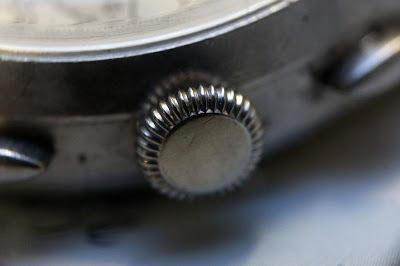 The old blued steel hands had some rust damage, but I think they add a nice patina to the watch. So I did not replace them. The bridge is signed "Ed Heuer & Co" in a very cool font. 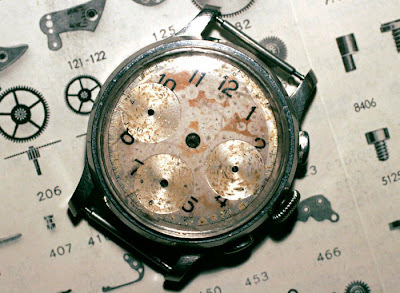 This was used before the Heuer logo was standard on all bridges. 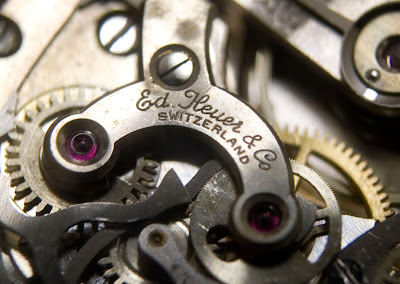 It was not untill 1945 that Heuer signed all movements with the Heuer logo. as you know, I am now the happy new owner of this beautiful vintage Heuer watch. And I must say, it is really the highlight of my small, but expanding, watch collection. It's pure magic how the dial changes it looks depending on the way you look at it. And it's running very precisely. The watchmaker did a brilliant job! Thanks for this great watch!